Back in July, we showed you exclusive photos of the Samsung Galaxy S6 mini. The phone was supposedly coming to market with a 4.6-inch or 4.7-inch screen, carrying a 720 x 1280 resolution. The Snapdragon 808 chipset was expected to be under the hood with a 15MP rear camera. But the device never materialized again. That is, until today. In the United Arab Emirates, online retailer LetsTango has a listing for the Samsung Galaxy S6 mini, and the specs match what we told you during the summer. The phone will feature a 4.6-inch Super AMOLED screen. The handset is powered by the Snapdragon 808 chipset, carrying a hexa-core 1.8GHz CPU and the Adreno 418 GPU. 2GB of RAM is inside along with 16GB of native storage. Our source was right on with the 15MP rear-facing camera, and there is a 5MP front-facing camera for selfies and video chats. The phone has a non-removable battery, includes a fingerprint sensor, and has Android 5.1 pre-installed. Despite the listing, the phone is not yet available for purchase. LetsTango is taking pre-registrations, which means that if you're interested in the device you can arrange to be notified when pre-orders begin. But that might never occur. Samsung hasn't confirmed whether or not it will release the device. lmao. mini edge. edge+ mega. it never stops! I hate the expression "nuff said". That, and "end of story". Can't wait to cop my Galaxy S7 Mini+ Neo Premium LTE-A edition! The 'Active' variant is way better IMO. Man, the S6 is small enough. I can't believe there's a market for something even smaller and less powerful. release the Mini version just when the next iteration is about to be released? Wow Samsung, just Wow. It's a fake. There will be no S6 mini. And at the end of the day, thus still blows krapples outdated garbage away. My 128gb S6 will do me for another few years. Incremental updates are just getting boring at this stage. Unlike iPhone some device like Z3/Z5 compact & Galaxy device too have good screen to body ratio so they remain small with bigger screen, i think that's the best. It's a fake. There will be no S6 mini. Specs are from old GFXBench test of SM-G9198 which turned out to be a flip phone. 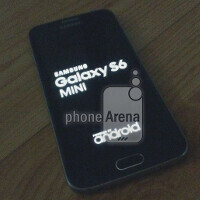 The Galaxy S isn't so big that it needs a Mini version. I never understood the need for this phone whatever market it is for. Don't buy all Samsung device. FYI, if your screen cracked! you need to pay 4/10 price of the phone/Tablet. Be smart!